In the Archivo General de la Administración, located in Alcalá de Henares, Spain, we encountered this fascinating set of documents regarding a case of what we would today call workplace harassment. The facts of the case are as follows: on April 21, 1918, a group of Spanish workers at the United Steel Alloy Plant in Canton, Ohio wrote to the Consul of Spain in New York, complaining about abusive behavior at the plant, and requesting his intervention in the matter. 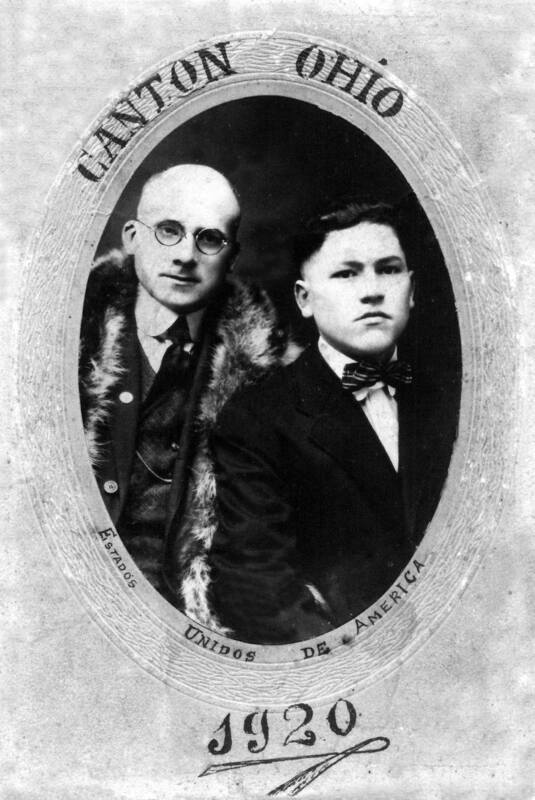 The Consul contacted the authorities in Ohio, and less than three weeks later, the Governor of Ohio had received a report from the state’s Adjutant General, which was forwarded to the Consul, and eventually found its way into the archive in Alcalá de Henares. What follows are 1) the workers’ complaint to the Consul, with a detailed description of the incident, which had occurred the day before; and 2) the official report filed by the Adjutant General, with a rather different account of what occurred at the plant. Which version seems more credible to you? What can we learn from this incident about the attitude of these Spanish immigrant workers in 1919 towards their host country? And what about the attitude of the other workers in the plant toward the Spaniards? Los abajo firmantes a Ud elevamos, como representante de nuestra patria, la más alta protesta sobre un asunto indigno cometido en la persona de un súbdito español el día veinte del presente. 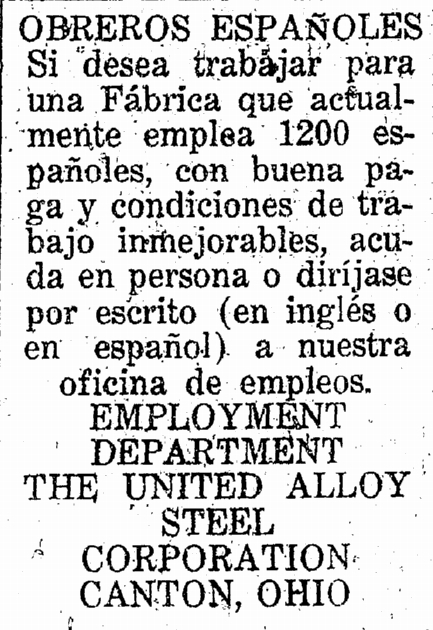 Hace días que los encargados y altos empleados de la United Alloy Steel Corporation de esta ciudad, están colocando los bonos del tercer empréstito de la libertad, y en dicha fábrica trabaja el español Antonio Fernández, y el día que más arriba le indicamos, se presentaron a dicho señor tres encargados y varios empleados, con el objeto de que se subscribiese al empréstito; cosa que no quiso aceptar, pues gana poco sueldo, y tiene que mantener a su numerosa familia. Los encargados de dicha fábrica, no quisieron o no creyeron las razones expuestas por el Señor Fernández, y le dijeron que “o tomaba el Liberty Bond, o lo colgaban”, y sin esperar otras razones, lo sacaron arrastro por toda la fábrica, y no conformes con esto, entre viente o treinta hombres, le metieron una gran barra de hierro por entre las piernas, y lo llevaban tirando en lo alto, y en esta forma lo llevaron hasta cerca del río, donde viendo las intenciones que llevaban los salvajes (que era colgarlo) tuvo que aceptar el empréstito forzoso. Todo esto pasó en presencia de más de dos mil personas, policías y encargados, que presenciaban impávidos el bárbaro espectáculo cometido con un hombre indefenso, súbdito de una nación que creemos debe de ser respetada, y con la cual esta Nación no está en guerra. Esperamos, Sr. Cónsul resuelva este asunto en la forma usual en estos casos, para que los criminales del brutal atentado sean juzgados por las leyes, pues no creemos se hagan solidarios de estos actos, dignos de que pasen en el Congo africano. The United Alloy Steel Corporation is one of the largest corporations in Canton and employs about 4500 men, most of the labor being unskilled labor. The plant extends over quite an amount of territory along the tracks of the Pennsylvania Railroad. Antonio Fernandez was employed in “B” plant, which happens to be the farthest part of the plant from the general offices of the company. During the noon hour on April 20 a flying squadron, composed of employees of the plant, were going thru the plant trying to persuade the men, who had not as yet subscribed for US Liberty Bonds of the third issue, to subscribe. This organization is an unofficial organization among the men, the officers of the company are not back of it. The Flying Squadron approached Fernandez and asked him to subscribe for one Liberty Bond. He replied: “To Hell with Liberty Bonds.” This decidedly un-American utterance from a man who is enjoying the protections of the American Government and earning large wages in American factories, so incensed the flying squadron that they grabbed him, put him on a rail and carried him for a short distance thru the “B” plant. There were no threats of hanging of further physical violence displayed and no officer or policeman, either in the City of Canton or of the United Alloy Steel corporation were present. Fernandez promptly agreed to buy a “baby” bond and was let down. An immediate investigation fo the affair was made by the Chief of Police, Haxmer, of the United Steel Alloy Company, who found this incident had occurred and that the other Spaniards employed in “B” plant were very much excited and were unwilling to go ack to work Saturday afternoon. After a couple of hours of negotiation, they agreed to go back to work and the company agreed to pay them for the time they were not working and all the Spaniards, as far as I could find out, excepting Fernandez returned to work and are still working for the Company. Fernandez was told by the officers of the Company that he could either work in “B” plant or they would transfer him o any other one of the departments in the factory where his services could be used, but he delined, was given his time to Saturday evening and left. Notice was at once given in the factory that an occurrence similar to the Fernandez affair would be grounds for discharge of all men who took part in it. It would seem that the outbreak was caused by the unfortunate remark of Fernandez. The action was not official, nor did any officer or policeman of the Company stand by and see it carried out. 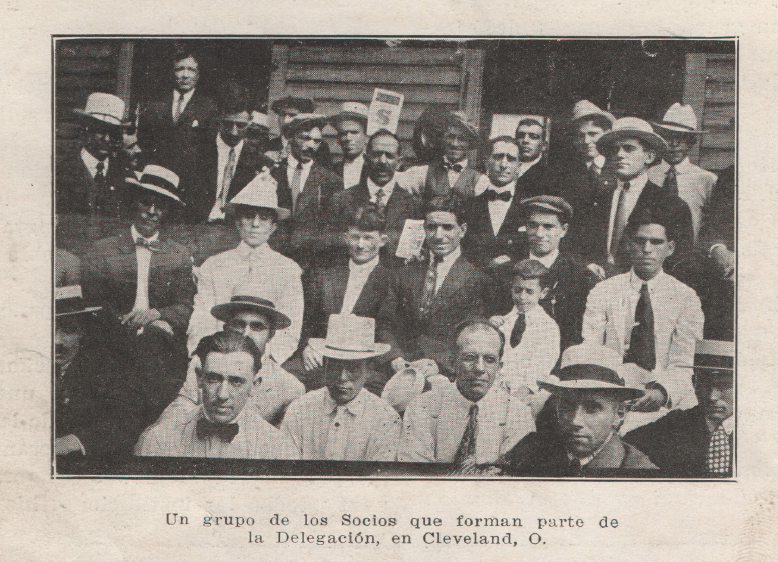 Españoles en Cleveland, 1919. Courtesy of Laura Goyanes. This entry was posted in Ohio and tagged Canton, Ohio. Bookmark the permalink.